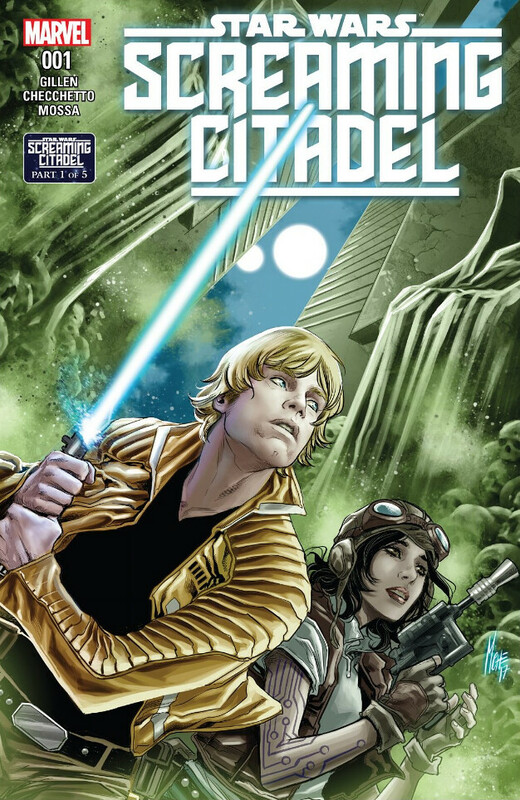 Screaming Citadel #1 kicks off a five issue crossover series between Marvel’s ongoing Star Wars and Doctor Aphra series. In this issue we see how Luke and Doctor Aphra cross paths and how she lures him into a partnership which leads to the Screaming Citadel. We also find out what’s lying in wait for them at the place. As they promised, this one is living up to its gothic horror inspiration. 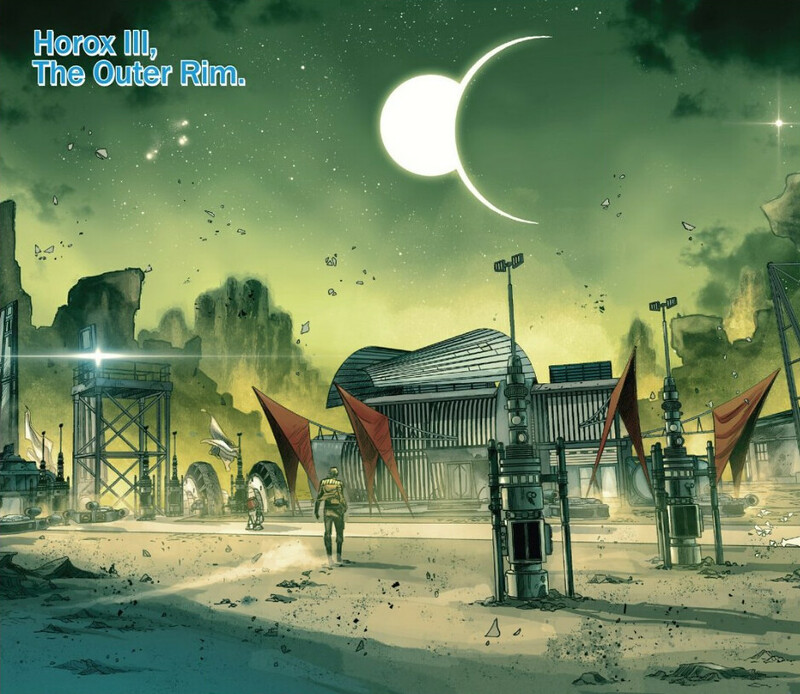 The story begins on Horox III, a secret Rebel outpost inhabited by Maz Kanata’s species. Luke gets into a bar fight, which scratches off the checkbox for cantina scene, and gets saved by Doctor Aphra and her Wookiee. This tentative alliance is sprung upon by Aphra as she talks Luke into helping her out with a small request. If he’ll accompany her to Ktath’atn to meet the queen, she’ll hand over the A.I. of an ancient Jedi master. Being gullible, Luke goes for it, even though the reader knows the ancient Jedi master is really an evil entity bent on revenge and bloodlust. Aphra isn’t in this for the archaeology or spreading of knowledge, she has her own interests in mind and there’s certainly a large pile of money involved. As they arrive on Ktath’atn, the plot thickens. They’re met by starved inhabitants, guards who inform them that the queen has certain allergies regarding certain species, and they find that the guests at the party have to offer something worthy to get the queen’s consideration. Fair warning, I am going to get into some fairly significant spoilers beyond this point. 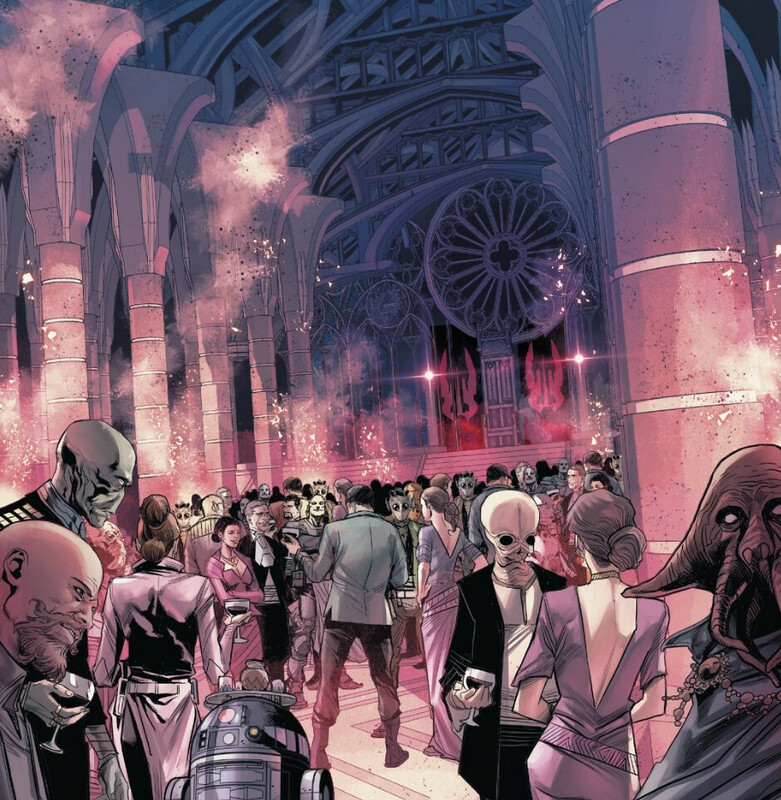 As the party goes on, Aphra presents Luke to the queen, there’s some manipulation going on to push Luke into using his Jedi powers, and they gain the queen’s audience. While everyone retires for the evening, the comic ends on one dramatic page showing what the queen and her subjects are up to. They feed off the life essence of the people on the planet. Kind of like life leeches. Apparently they don’t go so far as to drain everyone dead, but they do make everyone look rather dreadful. At that point, the queen reveals that it’s been a long time since she’s tasted a Jedi. Dun dun duhn! The writing for issue number one her is okay. It’s not great, it’s not bad, it just works. There’s nothing particularly memorable about the story or the dialog. It has its moments, it’s enjoyable and entertaining, but there’s nothing that truly stands out as great or packs in a wow factor. 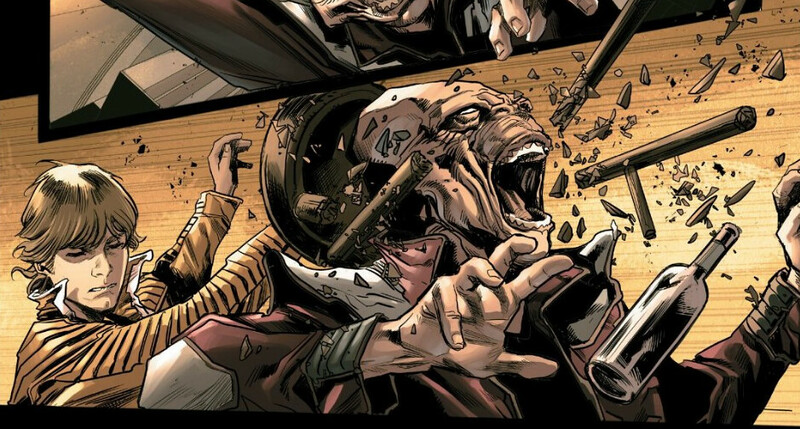 It does setup the plot for this mini-series crossover and it creates likeable characters out of both Luke and Aphra. It further develops the unspoken romantic history between Aphra and Sana, sets the stage their for an eventual rescue, and it sets up the bad guys of the story. While it’s not an issue that will have you going around recommending this to everyone as a must read, it is a fun read. Keen eyes may notice that the furry guy looks a lot like a young, cleaned up version of Bistan’s species. As for the artwork, Marco Checchetto does a good job in this issue with the help of colorist Andres Mossa. They capture the action, the environments, the characters and the emotion of the story. There’s a lot of detail to the artwork and some good likenesses. Marco doesn’t go for the photorealistic look with the main characters, which lends toward more of a natural and smooth feel to the images. Sometimes going too photorealistic can draw you out of the comic, especially when a particular image just looks wrong. When there’s a bit more leeway to the artwork, it’s not as jarring once you accept this is what the character looks like in this story. Beyond that, there’s some great detail to the scenery, making the environments feel immersive. Plus there’s a lot of attention to the aliens with plenty of recognizable species. The colors have a nice mixture of tones and do a great job of making the artwork pop. It’s good stuff. In the end, Screaming Citadel #1 is an interesting and entertaining start to this crossover event. I give it a four out of five metal bikinis. Part two of The Screaming Citadel will pick up with Star Wars #31.